6,000 Sachets of powder (5g) to enable water treatment at the household level in first phase emergencies. Combined flocculation and disinfectant sachets for treating water at the household level. 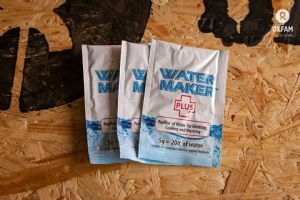 These sachets are used when water is too turbid for chlorine tablets to be effective on their own. The contents is mixed with water and after 30 minutes the flocculant causes the suspended material to clump together then sink. Clear, chlorinated water can be poured off and used. Typically, for use in flooding type scenarios where people are still in their houses and it is impossible to have a centralised water point. After explaining to families how to use the sachet they should be given up to a months supply solely for drinking water. This strategy is only for the first few weeks of an emergency. 6,000 sachets is sufficient for providing drinking water (4 litres per person per day) for 1,000 people for 30 days. A newly introduced method or technology is likely to be less successful than a known and familiar one.